Benefits of red beet on health are well-known for ages. It is one of our best vitamin and mineral sources, especially by the end of winter. It contains vitamins C, B1, B2, B6, beta-carotine, niacine, biotine. It is extremely rich in folic acid. Phyto-chemicals: polyphenols, flavonoids, antocyanidines, carotinoids, enzymes and glucose. Red beets are considered excellent haematogenous (blood-forming) plants by popular medicine. It is a nourishing, flavoury plant, one of the sweetest vegetables, with the highest sugar content. The root contains big quantities of pectins, promoting discharge of heavy metals, microorganisms/germs dangerous to the digestive system, plus superflual cholesterol out of the body. Due to its high potassium and magnesium content, it is extremely useful in the prevention and treatment of hypertension or other cardiovascular diseases and it also contributes to physiological nutrition of the body and the growth of muscles and stamina. Zinc, manganese and copper promote growth, development and multiplication, therefore they regulate metabolism, benefit the functioning of sexual glands. It stimulates formation of erythrocytes, it is beneficial to blood-pressure, cardiac functions and nervous system functioning. 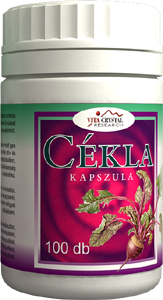 Red beet enhances gastric acid formation, improving pre-digestion of proteins and utilization of amino acids this way. It stimulates the functioning of the liver, intestines and kidneys, enhances the removal of poisonous substances and scum. It improves general state of health, it is beneficial in case of gastritis, haemorrhoids or hyperacidity. Due to its mild diuretic effect it reduces hypertension. It restores acid-alkalic balance of the body. Besides, due to its excellent fat-burner and liver-protective power, it is also recommended in case of alcohol addiction. General blood-picture results of patients undergoing chemotherapies have shown significant improvements following red-beet cures. Experience in the field of early stage lymphotic tumour treatments are promising, too. Red beets also moderate unpleasant symptoms in connection with the critical age. They slow down early ageing and help to fight colds and flu.